Sam Jones, bass; Philly Joe Jones, drums. 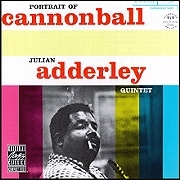 Portrait of Cannonball strikes us as a most fitting title for Cannonball Adderley's first album for Riverside, not only because of the unusually expressive photograph of the man on the cover, but also because the contents of the LP seem to make up an equally expressive musical "portrait." The colleagues he selected for this album include, first of all, Blue Mitchell, an exceptionally gifted young trumpet man who is an old friend from Florida days. It was Cannonball who brought Blue forcibly to Riverside's attention and it was Cannonball who felt that using Mitchell on this LP would be a most helpful way of introducing him. Sam Jones, one of the best of several superior young bassists currently on the New York scene, is also from Florida and was an important part of Adderley's own group. Philly Joe Jones, who was Miles Davis's drummer when Cannonball joined that unit, is one of today's most formidable rhythm men. He can be heard with great frequency on Riverside LPs and his presence here is an indication that Cannonball shares our high opinion of him. Bill Evans, also currently featured with Miles, is a brilliant and distinctive stylist just beginning to gain recognition. The friends-and-associates aspect of this "portrait" is also in evidence in the repertoire. In addition to one free-blowing version of a standard ("People Will Say We're In Love"), there are two Cannonball originals ("A Little Taste," [mp3] first recorded on the first album Adderley made; and "Straight Life," a new ballad), a blues contributed by Sam Jones, a new scoring of one of the best tunes of the talented composer-arranger-altoist Gigi Gryce, and finally the Oriental-flavored "Nardis," one of Miles Davis's rather infrequent compositions, specifically written for Cannonball's Riverside debut.